This guidance provides step-by-step information on requesting our Plan Assistance Service using our online services portal. Some fields on the form are mandatory. Enter dates using the dd/mm/yyyy format. Avoid using your browser’s navigation buttons. If you need to move between pages as you complete the form, use the navigation menu. You can save your submission when the save button is available at the bottom of your screen. Clicking save will create a draft version of your request and return you to the homepage. Log into online services and choose reports from the left menu. On the reports homepage, click on create new request. The create a new request page displays all available report types and their corresponding fees. 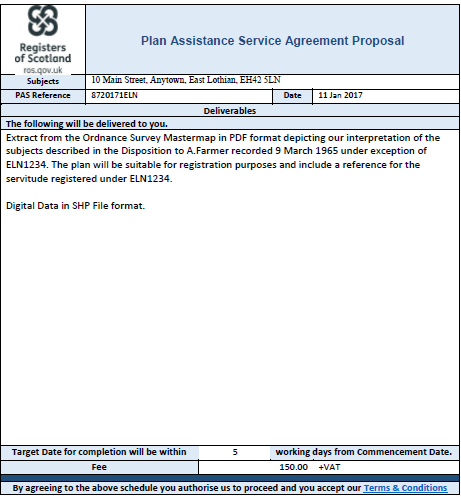 The costs for plan assistance are listed in the lower table. To begin your request, use the pull-down menu at the top of the page. Select PRR11: Plan Assistance Service and click next. Complete the request details page. Enter a postal address or suitable description of the property. If you have additional information that will assist in the identification of the subjects on the Ordnance Survey map, provide it in the second box provided. A plan or sketch of the approximate extent or location of the subjects can be helpful. 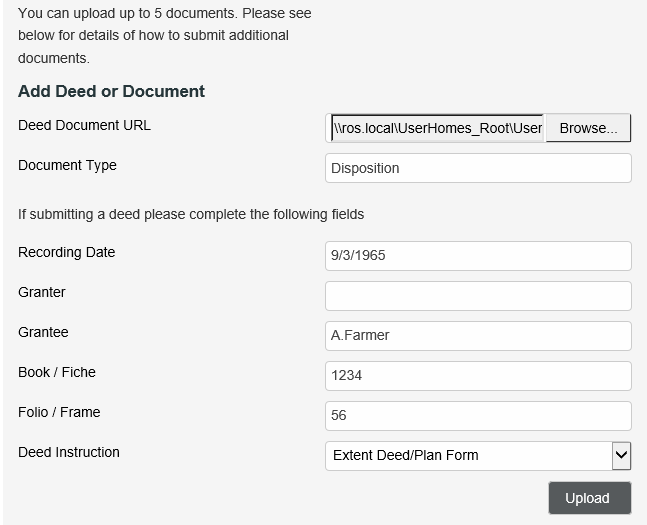 You can upload a plan using the add deed or document part of the submission. The deeds/title details part of the submission form is designed to be flexible so you can submit information in the most appropriate way for your specific request. Because the Plan Assistance Service costs are determined by the number of titles we are required to examine, it is important that you assess the number of titles you believe will be examined and enter this number in the field provided. We will confirm the number of titles in the service agreement proposal. In the details of your request field please list descriptive, excepted and other types of deed separately to enable us to process your request as quickly as possible. Where you are detailing a large number of writs it is advisable to prepare a separate inventory of writs that can be uploaded in the add deed or document part of the submission. In the example below, the request is to plot the subjects described in a 2016 disposition. However, because this is a prescriptive writ and refers to the 1965 and 2007 deeds in order to describe the subjects, we only need to examine these two earlier writs. Because the 2007 writ is land registered, we only need a note of the title number. No further information is required for that title. You can upload up to five documents to support your request. Deeds, plans and other documents in PDF format, Word documents and digital data files are all acceptable. We don't support batch uploads, but you can use zip files to allow larger numbers of documents to be uploaded. Note that there is a 20mb file size limit per upload. Additionally you can email deeds and other documentation to us at pas@ros.gov.uk but we prefer you to make a submission in the first instance in order to obtain a Request Number to quote in your email. This will ensure we associate your emailed documents with your request. 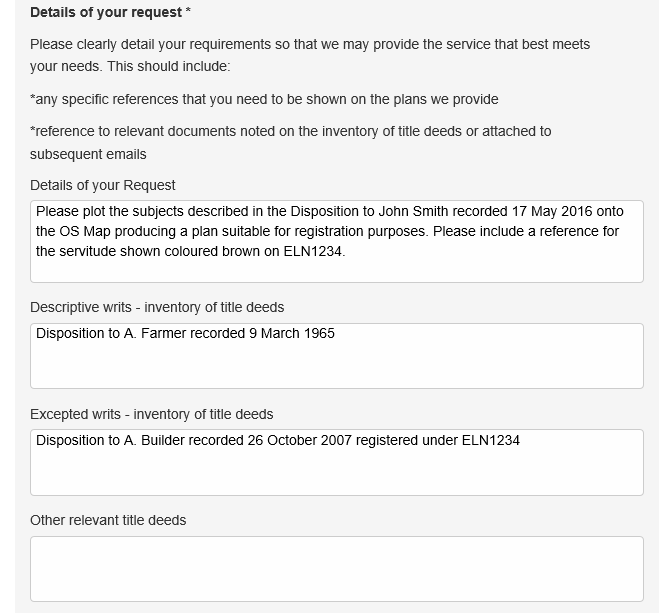 When uploading deeds individually we ask you to provide details of the deeds such as recording date, parties, etc. Use the dd/mm/yyyy format when you enter the recording date. Once you've completed all your uploads, click next. Once you agree to the terms and conditions click 'submit request'. You will receive a notification email confirming your submission. You will now see your newly submitted request in your open report requests list with the request status of 'awaiting service agreement'. The Plan Assistance Service will review your submission as quickly as possible and prepare a service agreement proposal. This will summarise what we intend to provide, the expected target date and the cost. You will receive a notification email once this has been completed and you will see the request status change to 'awaiting approval' in your open report requests. To review the service agreement click on view and then in the navigation menu click on service agreement. This will take you to preview request details. Click on the provided link to the service agreement. Carefully consider our intended provision to ensure it meets with your specific requirements. Note the number of working days we have allowed for completion on receipt of your agreement and the cost subject to VAT. If you have any questions or wish to negotiate the terms of this agreement then please contact us at pas@ros.gov.uk, quoting the request number. If you are happy for us to proceed, check the box to confirm and click on approve. You will now see the status of your request change to 'submitted' in your my open report requests and you will receive a confirmation email notification. Once you have agreed the service agreement we will proceed with the aim of completing your request within the time specified. As soon as one of our team assigns your request to begin work you will see the request status change to 'in work'. You are no longer able to cancel your request at this stage via the portal. If you do not wish us to continue with the request or have any queries please contact us at pas@ros.gov.uk quoting the request number. One we have completed your request you will receive a notification email. Your request status will now be 'despatched' and will appear under in 'my recent completed requests'. 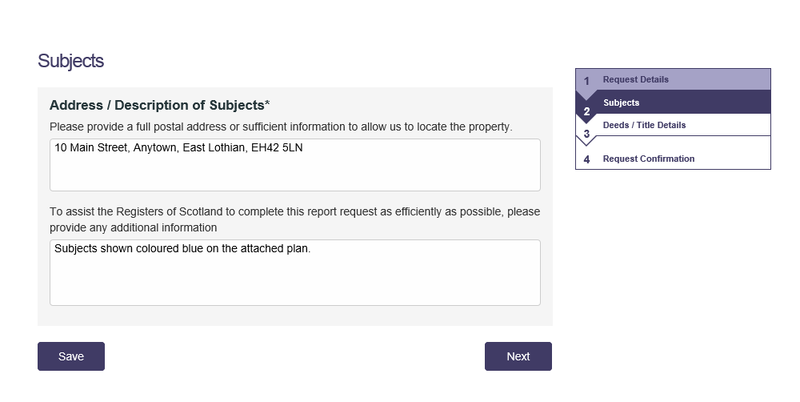 By clicking on view reports in my recent completed requests you will be able to view your report, the invoice and also download the plans and other information prepared by us by clicking on view additional documents. Our deliverables will normally consist of a single zipped file containing your plans, data and other appropriate information. Should you have any queries please contact us at pas@ros.gov.uk quoting the request number. The report will detail the delivered plans as well as disclosures from the check against the cadastral map. The report number can be used in an application for registration. The plans we provide will be high resolution PDF files set at print scales suitable for registration purposes unless otherwise stated. Digital data will be in ESRI SHP file format which can be used in GIS software if applicable. DWG and DXF file formats are available on request. Additional documentation such as textual files and spreadsheets may also be provided if appropriate. If you have any queries, please contact us at pas@ros.gov.uk quoting the request number.